Please Help save my son!! 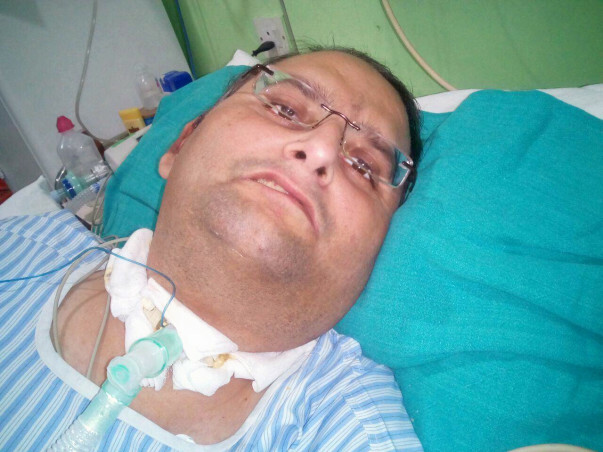 My son Gautam Grover, 34 years old, father of an 8 year old girl met with an unfortunate accident on 29th August 2016 which caused severe cervical injury on his neck. 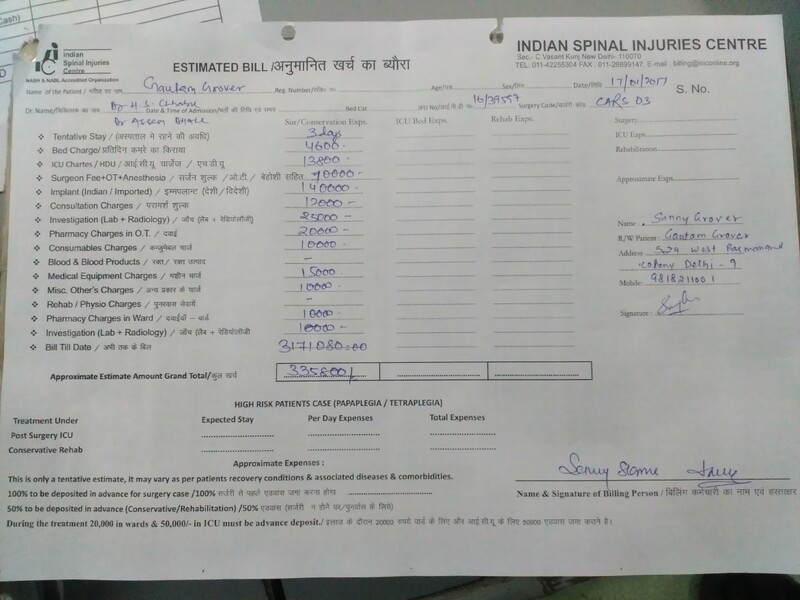 He has been admitted at Indian Spinal Injury Centre, Vasant Kunj, New Delhi since 31st August 2016. 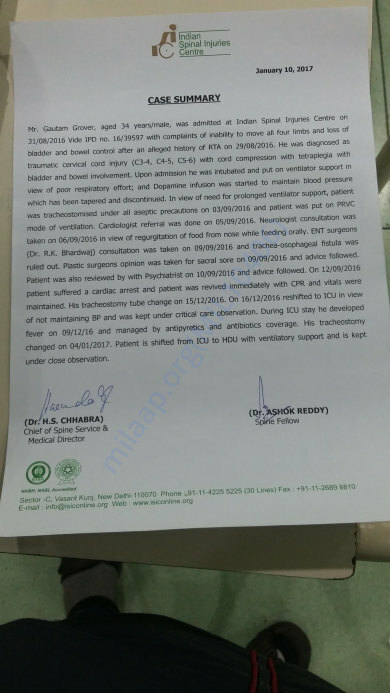 Due to the accident, his body has been paralyzed below the neck and he has suffered major cardiac arrest that caused further deterioration of his health. He is unable to breathe on his own and is on ventilator support. He has been sole bread earner of the family and I have used all financial resources to cover for his hospitalization expenses till now but considering his level of injury at C3 – C4, he will need ventilator support for a longer duration. He needs an effective rehabilitation program which is specialized care available in very few hospitals in India such as this one where he is admitted. 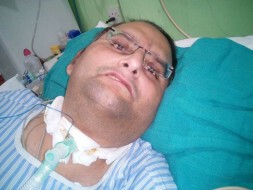 The average treatment for his hospitalization is around INR 5 Lacs per month. 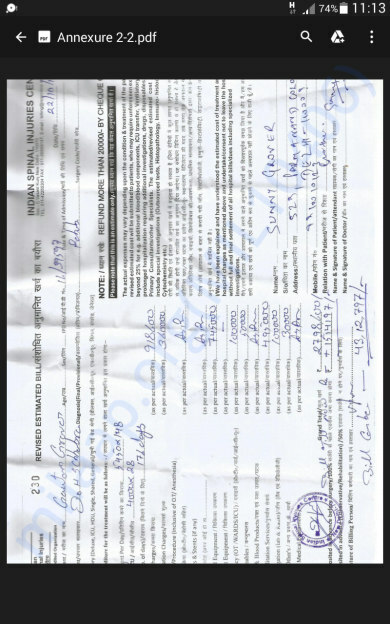 I have paid from all possible means available including loans an amount of INR 19,90,000 against a till date bill of INR 30,68000.I am 60-year-old and my son was the whole sole care taker of our family thus, I am unable to cope up with hospitalization expenses any further. 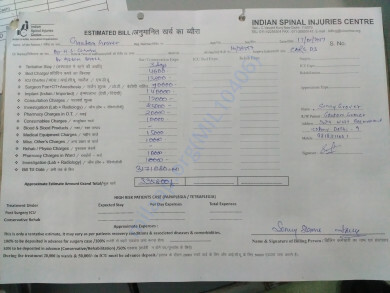 He needs complete treatment and rehabilitation which is available only at the Spinal Injuries hospital to recover his body mobility to maximum use and we have been advised to purchase a ventilator considering his injury level which will cost INR 4.5 lacs in addition to hospital estimate that has been provided. Please contribute to save a human life and help save our family! Do pray for my son and May God bless you for your contribution and blessings! We wanted to share the update on Gautam. He had his pacemaker surgery on 27th February. He is currently in CCU for observation. Pacemaker will stabilize his heart condition which in turn will increase the chances of weaning off the ventilator. I sincerely believe that God has taken first step on recovery path for my son and I am very hopeful to see more and more positive break throughs as time passes along...keep praying! God bless you all. Today Gautam steps into the 35th year of his life; none of us ever imagined him to be spending his 35th birthday bed ridden in a hospital ward almost 6 months post his accident but such is life!! I just pray from bottom of my heart that God blesses him with all those normal joys of life that he used to experience on his earlier birthdays - be able to thank others when they wish him or cut cake along with his loving daughter so, he can feel the sweetness of this life again. May God give him a speedy recovery and you do pray for him on this special day. We have faith that God will soon make him experience all those little wonders of life again! Showering him with lots of love and prayers on this special day, Happy Birthday, Gautam! Thank you for your overwhelming support on this campaign. An unselfish act like this restores your faith in humanity and kindness. As for the update on Gautam’s health, doctors have deferred the decision on us to finalize a date for pacemaker surgery for him. We’re contemplating on our way forward as it will involve significant amount of risk to his life but sooner or later, it has to be done to get his heart stable. I sincerely believe that our prayers will do wonders for him and not only he will fight but God will bless him with miraculous recovery! We look forward to your continuous support as Gautam fights through this battle for his life and keep praying that he emerges as a winner for sake of his family and child. Please keep sharing this campaign as much as you can and help us achieve the goal amount needed to save a human life. God bless you all! Wishing you a Speedy Recovery Gautam. Get Well Soon.